Heart of Christmas Cookies Chocolate! Chocolate! Chocolate Cookies! 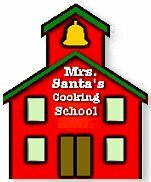 NOTE: Mrs. Claus prefers adding the colored sugar sprinkles to the cookies immediate after placing them on a rack to cool. They're still warm enough to adhere the sugar but it doesn't mess up the cookie sheet. With mixer at low, beat confectioners' sugar, meringue powder, and 1/3 cup warm water until mixture is stiff and knife drawn through it leaves a clean-cut path. Don't be surprised if this takes about 7 minutes. Tint with several drops of food coloring. (The more drops, the deeper the color.) As you are working with this frosting, keep covered with plastic wrap to prevent it from drying out. For a thinner frosting, you can dilute it slightly with warm water. In a saucepan using medium heat, heat sugar, molasses, ginger, allspice, cinnamon, and cloves to boiling, stirring occasionally. Remove saucepan from heat, stir in baking soda (mixture will foam up in the pan). Stir in margarine or butter until melted. With fork, stir in egg, then flour. On floured surface, knead dough until thoroughly mixed. Divide dough in half, wrap half with plastic wrap and set aside. With floured rolling pin, roll remaining half of dough slightly thinner than 1/4 inch. With floured 3- to 4-inch assorted cookie cutters, cut dough into as many cookies as possible, reserve trimmings. Place cookies, 1 inch apart, on 2 ungreased large cookie sheets. Reroll trimmings and cut out more cookies. Bake cookies on 2 oven racks 12 minutes or until edges begin to brown, rotating cookie sheets between upper and lower racks halfway through baking time. Remove cookies to wire racks to cool. Repeat with remaining dough. When cookies are cool, frost and decorate. Set cookies aside to allow frosting to dry completely, about 1 hour. If not using right away, store in tightly-covered container. To make hanging cookies as ornaments, before baking take a toothpick and create a hole the top of the cookie. Then use fishing line after cooled to create hanger. Preheat oven to 375 degrees. Beat butter and sugar and beat until creamed and fluffy. Add milk and vanilla, mix well. Stir in flour, then cherries and nuts. Shape into 3 equal rolls. Roll dough in coconut to coat outside. Wrap in waxed paper or clear plastic wrap and chill throughly. Cut into 1/4 inch slices. Place on an ungreased cookie sheet. Bake for about 12 minutes or until edges are golden. In a large mixing bowl, cream together butter, shortening, 1 1/2 cups sugar, eggs, and vanilla. Blend in flour, cream of tartar, soda, and salt. Shape dough by rounded spoonfuls into balls. Mix the 2 Tbsp. sugar and the cinnamon. Roll balls of dough in cinnamon/sugar mixture. Place 2 inches apart on ungreased baking sheets. Bake 8 to 10 minutes. Remove immediately from baking sheets and cool on wire racks. Line the bottom of a cake pan with saltines. In microwave, melt butter until its bubbly. Pour butter over crackers and place in oven. Bake about five minutes. While cookies are baking, melt butterscotch chips in microwave. Dip saltines in melted butterscotch chips. Place on rack to allow to drip and set. Mix chocolate chips and sweetened condensed milk in a microwave safe bowl. Microwave until chips are melted. Stir in vanilla and mix well.. Stir in marshmallows and nuts if desired. Pour into a wax paper lined or buttered cake pan. Chill until fudge is set. Combine potatoes, powdered sugar (retaining some for rolling,) coconut and extract. Mix well. Roll into balls and refrigerate for one hour. Melt chocolate bark in microwave or in double boiler. Dip balls into chocolate. Place on rack and allow to dry and set. Blend the condensed milk and vanilla. Add the powdered sugar and stir until smooth. Stir in the coconut. Pat the mixture firmly into a greased cake pan. Chill in the refrigerator until firm. In a microwave or double boiler, melt the chocolate, stirring often. Cut chilled mixture into 1x2-inch bars. Place 2 whole almonds on top each bar. Dip each bar into the melted chocolate, place on rack and allow to set up. Mix cake mix, whipped topping and egg. Place on rack and allow to cool. In the bowl of an electric mixer, beat butter until creamy. Gradually add sugar and continue beating until light and fluffy. Add vanilla and mix well. Gradually add ground walnuts and flour mixture, beating until smooth. Fill cookie press fitted with star shape with dough. Press onto a cookie sheet about 1 1/2 inches apart. Bake until golden. Place on cookie rack and allow to cool. When cooled, sprinkle half the cookies with powdered sugar. Place a dollop of jelly on the tops of the other half of the cookies. Place the powdered tops on top of the jellied bottoms. Place in an airtight container for storage. In the microwave, melt chopped chocolates and butter. Mix thoroughly and allow to cool. With electric mixer, mix eggs, sugar, instant coffee and vanilla. Mix in chocolate mixture. Sift in flour, baking powder and salt. Add chocolate chips and nuts and mix. Line cookie sheets with foil. Drop dough by spoonful onto foil. Bake approximately 10-12 minutes. Cool on cookie rack and store in airtight container. Beat shortening, sugar, baking powder, salt, and cinnamon until well combined. Add flour, milk, vanilla extract, and eggs; mix well. Stir in pecans, prunes, red candied cherries, green candied cherries, and candied orange peel. Spoon into mini-muffin pans. Garnish with candied cherries. Bake about 10-12 minutes or until an inserted toothpick comes back clean. Allow to cool for ten minutes before removing from pans. Place on rack to continue cooling. Store in airtight container. Cream together butter, sugar and vanilla. Add half-and-half to creamed ingredients then sifted flour until mixed into soft dough. If dough is crumbly add a little more half-and-half (you don't want sticky dough, more like bread or piecrust dough) If you like sweeter cookies you can add more sugar to taste and then a little flour for right consistency. Chill for at least an hour. Work up into small balls for each cookie, roll the ball in sugar and then press down criss-cross with fork dipped in sugar onto ungreased cookie sheet. Bake 10 to 12 minutes at 350 or until set. Do not brown, they come out white with lightly tanned bottoms. Makes 2 1/2 dozen could be less if you make the balls bigger than medium size. Note: You can add cinnamon to the sugar if you like the flavor or might want to try a dash of almond extract in the dough for a slight cherry flavor. Form into small balls, roll in sugar and then criss-cross press with fork dipped in sugar to keep from sticking to dough. Bake 12 to 14 minutes until set, comes out light brown. 2 to 3 dozen depending on the size of balls you make. Mix granulated sugar, butter and milk in a pan. Put over medium heat; bring to full boil; boil one minute. Remove from heat; add peanut butter, vanilla and cocoa. Stir well until peanut butter is melted. Add rolled oats and blend thoroughly. Pour into buttered 8 or 9" pan. Cool; cut into squares. Can also be dropped by spoonfuls onto waxed paper. Combine cake mix and nuts in large bowl. Stir in butter. Stir in 2/3 cup of evap. milk. Batter will be thick and yummy! Spread half the batter into greased 13x9 baking pan. Bake at 350 for 15 minutes. Combine caramels and remaining evaporated milk in small saucepan. Cook over low heat, stirring constantly, for about 10 minutes until caramels are thoroughly melted. Sprinkle morsels over baked layer. Pour caramel mixture over top. Drop remaining batter by heaping teaspoons over caramel mixture. Bake for 20-25 minutes at 350 --- top layer will be soft when you remove pan from oven. Cool in pan. Courtesy of Michelle Lee, author of "Jonah's Way." Visit her website by clicking here. Mix all ingredients except Confectionary sugar and roll into small 6" longs, 3" round. Dredge in over Confectionary sugar and refrigerate. Place 3 cups all-purpose flour in large bowl. Work into flour 1 cup butter, chilled and cut in pieces, using pastry cutter or fork. Add gradually 3 egg yolks, slightly beaten; 1 1/2 tbsp. cream; and 2 tsp. grated lemon peel. With palms of hands, shape dough into smooth roll. Slice into 48 pieces. (If dough is too soft and sticky to handle, chill for a short time.) Shape pieces into balls. Lightly sprinkle a small area of working surface with confectioners' sugar. Roll one ball at a time into a circle about 1/16 inch thick. Spread dough with 2 teaspoons of Solo fruit filling in your choice of flavor. (Or use several different flavors and make assorted cookies.) Gently lifting nearest edge, roll; shape into crescent by curving ends of roll slightly. Place crescent onto cookie sheet lightly sprayed with nonstick cooking spray, with overlapping edge underneath. Brush crescents with slightly beaten egg. Bake at 375 degrees 15 to 20 minutes; remove to cooling racks. Just before serving, sprinkle with confectioners' sugar. Courtesy of Elizabeth Delisi, author of "Since All Is Passing." Visit Elizabeth's website by clicking here. Put sugar, milk, and soda in a large sauce pan. Bring to rolling boil and cook to soft ball, stirring constantly. Remove from heat and add butter, vanilla and pecans. Beat until creamy and drop by spoonsful onto waxed paper over which salt has been sprinkled. For more crispy (rather than creamy) candy, beat less. Boil sugar, water and spices until syrup spins a thread as it drops from a spoon. Add pecans to this syrup. Stir rapidly and continuously until nuts appear dry. Spread on waxed paper, separate with fork/spoon/fingers (don't burn yourself!) and allow to cool. Walnuts or blanched almonds are also good. Experiment with spices and come up with your own favorite variation. Courtesy of Rickey Mallory, DiskUs Publishing author. Check out Rickey's novella in "Mistletoe Magic" by clicking here. Or Rickey's personal page by clicking here.